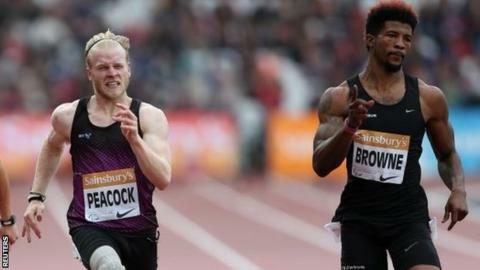 American sprinter Richard Browne says British rival Jonnie Peacock was "the least of my worries" heading into next month's IPC World Championships. Peacock, 22, will not compete in Doha due to injury. But Browne, 24, who was runner-up to Peacock at London 2012 and the 2013 World Championships in the T44 100m, said: "Jonnie hasn't really run well over the last year and a half." However, he said the Briton's absence would be "devastating" for the sport. Browne told BBC World Service that the news, confirmed on Thursday, "wasn't a surprise". "Jonnie has always been injury prone, which is unfortunate not only for amputee sprinting but for British Athletics and the whole sport." He added: "To be quite frank I've beaten Jonnie for the last two years. He was the least of my worries, to be honest with you." Browne insists he was more concerned by new world record holder and fellow American Jarryd Wallace and Germany's Felix Streng. But he continued: "Jonnie always brings out the best in me and the rivalry has been good for the sport. "Him being there was going to be awesome, because it would have shown we have five, six guys who are ready to run fast. That's more devastating." Though Browne only managed silver at the 2010 Paralympics and subsequent Worlds, he has been running quicker than Peacock. Most recently, the American beat his British rival at the IPC Anniversary Games in London in July.